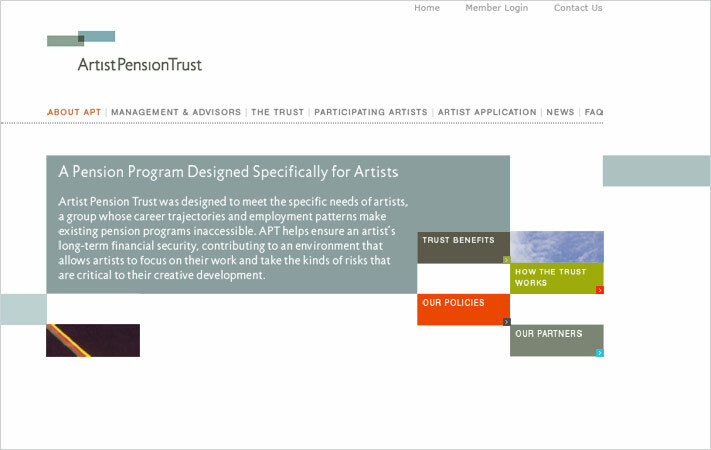 MutualArt, an independent company dedicated to creating new financial services for the art world, launched its first program, Artist Pension Trust (APT), in May 2004. 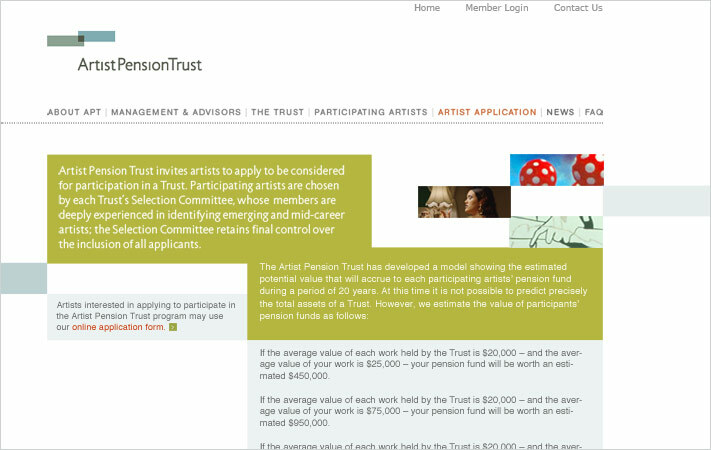 APT is the first pension program created specifically to provide emerging and mid-career artists with long-term financial security. MutualArt hired Cabengo to develop graphic identities and websites for the new initiatives. The design challenge was to map the intersection of art and finance, to develop a look that would appeal both to young, talented, highly-motivated artists and to serious investors. 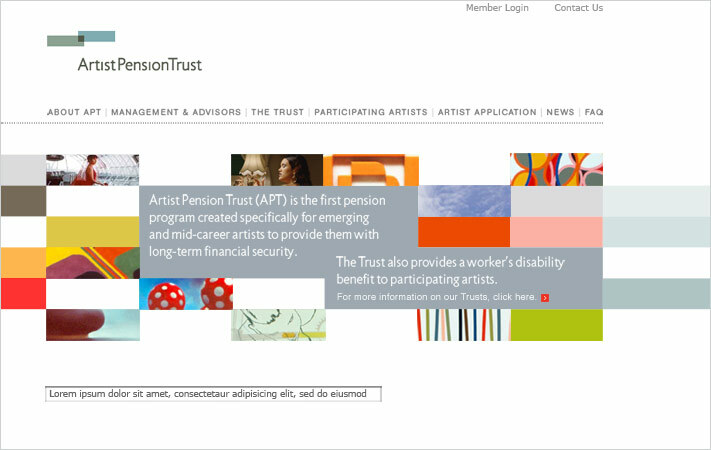 For the APT website, the challenge was to create a sophisticated, dynamic website that promoted the artists and works in the collection, positioned the program at the cutting edge of art and finance, enabled an online application process, and provided the company with an easy means both to maintain the dynamic content on the site and to automate back end business processes. The Mutual Art and APT graphic identities each blend a lively, contemporary typeface with simple interlocking graphic elements. The APT website features artwork details throughout the site, presented as randomly generated bricks of line and color that mirror the stepped horizontal bars in the APT mark. These clickable graphic details keep the site visually fresh, and underscore the centrality of artists and artworks to the new enterprise. The rhythmic ticker on the homepage gives larger context to the program’s vision. The overall impact is an easy-to-navigate, sophisticated site that uses lively colors, simple geometric shapes, and distinctive graphic details to chart this innovative new intersection for the worlds of art and finance. The Mutual Art website uses a complimentary look and feel to position the parent company as a serious and creative new player in the field. In addition to the websites, Cabengo built a custom application to enable easy site maintenance after launch for non-technical staff. The back end system also automates the complex work flow required in the multi-step selection process of new artists and the addition of new funds. The system features several access levels, each with it is own functionality; a library of email events with dynamic text triggered by status changes; and review, rating, and reporting functionality.